From left to right : Miguel, Abby, Parneet, Jenny, Shailvi, Ryan, Shubhkarman, Manpinder, Katia, Isabel, and Vy. Dr. Avnish Jolly Dated April 15, 2019, Winnipeg, Manitoba CANADA : Law Day was celebrated across the country to celebrate the anniversary of the Canadian Charter of Right and Freedoms which came in to effect in 1982. The Court Office opened its doors to the public on Sunday, April 14, 2019 for Law Day Celebration. The day serves as an opportunity for curious guests to learn all about the Canadian Justice system. 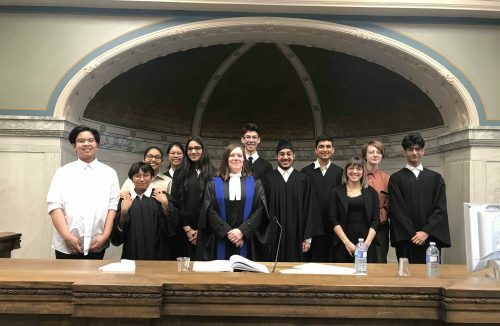 As a part of Law Day Celebrations, Manitoba Bar Association organized the Mock Trial with the help of School Children and different volunteers. It was recognized that children needed “Necessaries” and keeping this in view that this Mock Trial will help the Children to understand Judicial System in the perimeter of “Necessaries”. In the group photo from left to right the students are Miguel, Abby, Parneet, Jenny, Shailvi, Ryan, Shubhkarman, Manpinder, Katia, Isabel, and Vy.